I do my shopping in second-hands. As you have to make your decisions whether to buy something or not quite quickly - otherwise it could be bought by someone else - my style develops every time I go shopping. Honestly, I think my friends are the best dressing people in Estonia. I always try to wear a lot of colour, because it gives me a good energy boost. 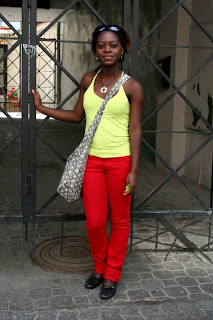 I have been wearing coloured jeans for a long time and now everybody seems to love them. I get my ideas from everywhere- music, films, magazines etc. I am a musician and I think my style reflects the music I make. Quality is very important to me and Diesel has a great quality-price relationship. When it comes to shopping, I am rather spontaneous. I think I can carry off different styles – I feel great in sneakers and in heels. I had this dress done by my own designs. This summer I am into dresses. I really dislike natural colours and prefer clean and interesting ones. I think the most stylish people in Estonia are 70+ men, because they are always so put together. I think Diesel has had some great collections, even if I don’t buy anything, they give me ideas. For example these golden suspenders were inspired one of their collection. 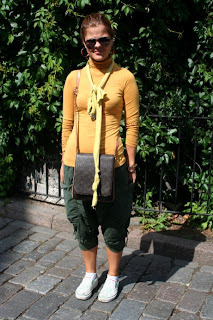 I like Estonian street style, because it is a combination of so many different styles, but in many other places all the “stylish people” look the same. I really like long feminine dresses. I buy my clothes from here and there. I don’t have any favourites, but when I worked for Zara I got many of my clothes from there. I make some of my clothes myself. Ideas come from high fashion, but I rarely buy any famous names. It is very important that colours match and your outfit looks as a whole. Comfortable shoes are also an essential. This summer I have been looking for leggins’ with frills and I finally found some. My favourite colour is green. People should pay more attention to what they are wearing. I think it is important to be stylish. I think it is easy to copy celebrities, but then you’ll lose your own identity. Luckily my style is too different. It is important to have your own style that you feel comfortable in. We like to wear tights and long tops. We come from Norway and street style there is quite different. 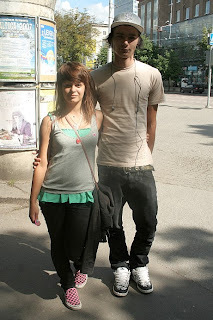 It is much more relaxed there, while women here tend to wear too tight and too short clothes. I really like flowy tops and shorts. At the moment my favourite colour is brown, but as it is summer I also wear a lot more bright colours. I really like to go through different magazines and look what different celebs are wearing. You can get great ideas from them! The most important pieces of clothing in my wardrobe have to be jeans. I think I have them in every colour. I used to wear a lot of black in spring, but now it is summer. 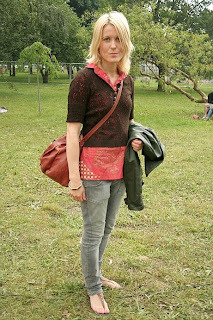 I live in Tartu and when I compare street style there with Tallinn, I must admit people here are way braver. I love dresses and interesting details. I got this oversized dress from Helsinki 10 and I work there too. Last thing I got was one Marimekko dress that hasn’t hit the stores yet and it looks great. Friend of mine says I have a good eye for combining clothes. Usually I describe my style with just one word – minimalism. I guess it can be also described as androgynous dandy/gentlemen. I do have favourite designers, but I don’t like name-dropping. My clothes tend to be black, white or grey. Many of my clothes come from second-hands, but there are also many shops and brands I love. This bag was a great bargain from a second-hand. I want to be unique. Nonetheless I have a soft spot for Mary-Kate and Ashley Olsen and Beckhams. My style has always been bit hippie bohemian, but as time has passed, it has changed to be more me and more natural. Mischa Barton has similar style and therefore I sometimes get ideas from her outfits. My favourite colour is brown. Thanks to Hel-Looks Finnish street style has become so popular and I guess it is because people here are really tolerant and don’t care what other people wear. It usually takes about an hour to get ready, but then I end up wearing just whatever is comfortable. I rarely go to second-hands, because it takes too much time to find something from there. I’m actually from Lahti and there aren’t many shops there, so I come down here for shopping. I like high-street labels and I value clothes that have a good fit and are comfortable. I think Scandinavian style is different and better than in Southern Europe. I am originally from Tallinn, but I have been living in London for a while now. My favourite places to shop are charity shops, Beyond Retro and Topshop. This year I have been really into baggy t-shirts. It is important not to care what other people think. Robert: I think Brian Molko and Chris Corner have very inspiring styles. I like to customize my clothes, good examples are these shoes and jacket. I love scarves. Natalie: I think sunglasses and accessories are an essential part of my style. I love colourful clothes. Music is very inspiring. We love all kind of colours, but especially neon ones. Nike Air sneakers are really cool too. We like to do our shopping in H&M. Dancing is something that influences our style a lot. 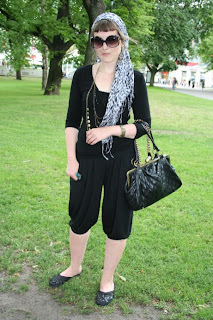 We hate Estonian chav culture – too many guys in sweats and girls in minis. I absolutely love my new Hunter rubber boots, so I am actually really glad it has been raining a lot! My favourite colour is obviously black. I cannot actually remember why, but it has been that way for a while now. The whole ‘rock scene’ is really inspiring. We love to shop in second-hands and also in H&M, but for example these sunglasses come from a random kiosk in Tallinn. It is all about wearing a lot of cool and unique accessories. Ideas come from music and dancing. Estonian men are really afraid to be different! I try to differ and I think many of my friends have started to do that too.Essential part of my wardrobe are skinny jeans and different scarves. I like to shop at H&M and New Yorker in Helsinki and at Team Nihilist in Tallinn. I like to spend money on fashionable and original clothes, but it doesn’t matter whether I buy from Hugo Boss or Zara. Wear whatever you want until you can pull it off. 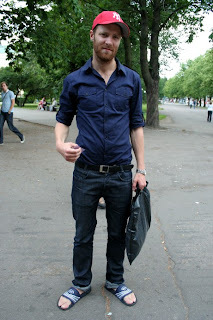 My favourite street style is in Moscow. People there are really crazy and unique. I think I have a dress-fetish. I want to have them in every length and colour. 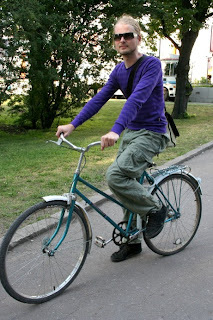 I wish there were more shops in Tallinn, because the lack of stylish labels is having an effect on our street style. Luckily many young people are very creative. I do most of my shopping in second-hands. I like when people actually are bothered to put effort into finding something cool and stylish. My friends have similar views. I like darker shades and old-school clothes. About six months ago I dyed my hair from blonde to dark and since then I have been wearing a lot of black. I think for one’s style it is essential to go abroad once in a while, because you can get so many ideas while travelling. After a trip I always have a way quirkier style than usually. I work as a buyer so I need to keep up with the newest trends. This summer my favourite colour is red. I’ve never liked red before, but somehow with every season my favourite colour changes. Today I am wearing Miss Sixty and Replay. The best ideas come from the streets. If you take something from one person and something from another, you can develop your own style. My friends say that my style is relaxed and simple yet cute. Egeli: I like to shop in second-hands and I really like Japanese street-style. I don’t understand “trendy” people, they all look the same. One should try to be unique. Sass: My favourite shops are Reede and Surfhouse. I think my style is affected by my friends. They tell me where the best shops are and things like that. I want my clothes to be casual and comfortable, but they need to have some edge. My favourite international designers are John Galliano and Vivienne Westwood, but there are very many young and talented Estonian designers emerging. I just got these Nike sneakers and I love them. My favourite colour is grey, so quite anonymous. I just bought a grey suit. 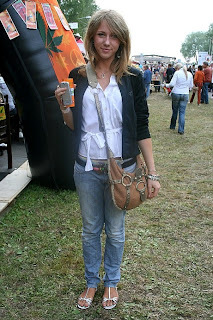 Today I am laid-back, because it is a beer-fest and no need to dress up here. If I want to update my wardrobe, I see what other people are wearing. My favourite labels are J.Lindeberg, Brunz Bazar and Diesel. Today I am wearing so many warm clothes, because Estonian weather is unpredictable. Therefore it is hard to have a summery style, when you need to still have all winter clothes ready. I recently had my hair done. I went from black to light brown. In summer you should be in lighter shades. In my opinion clothes reflect your personality and tell a lot what kind of person you are. I just got off from stage and therefore I am bit dressed up. Every now and then I like to do my own clothes. Ideas come from here and there. I really dislike colours and most of my clothes are black, white and a few are brown. I don’t find many clothes from second-hands; maybe I am not satisfied with the quality. In Estonia my favourite is Mango, but every summer I go to Russia and there are really cool small shops. I got these shoes from there for around 25 kroons. Today I am head-to-toe in second hand clothes, oh, except these shoes that I got from Spain. I love all colours, but maybe I just prefer green bit more and white bit less than others. I really like Anna Sui, because her creations are as eclectic as I am. I just got back from Manchester, grabbed first clean clothes from my bag and ran here. My style is laid-back and about mixing different styles. I really like Mischa Barton’s and Nicole Richie’s style. I think Estonians aren’t brave enough to wear more daring clothes. Unusual and unique use of accessories is very important aspect of my style. I would love to become a fashion designer or stylist. My style is influenced by Patricia Field’s work and I love designers such as John Galliano, Stella McCartney and Viktor & Rolf. I am not trying to be original, but I think appearance reflects our personality and therefore we are all unique. I have rasta hairstyle, because it is really comfortable and easy to handle. My favourite shop is Croptown at Ülemiste’s. 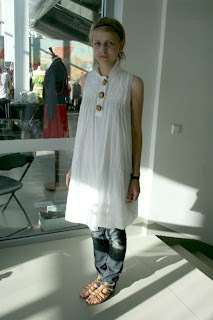 I really like Estonian designers and I am interested in fashion as a whole. My favourite designer duo is MAKI. I used to wear a lot of black, but one friend of mine found it weird and now I try to go for lighter shades. I’m really interested in fashion and I do fashion sketches to gather up ideas. I’ve been living in St.Petersburg for a while, but I’ll move soon to Thailand, so my style needs to change to suit another climate. My favourite label is Guess, it is stylish and not over the top. I really like warm shades of colour. My favourites are green and brown. I do a lot of shopping in vintage stores and flea markets. These trousers come from one in Paris. This summer the biggest trend in Tallinn is wearing dresses and skirts. I used to work in fashion business so fashion is an essential part of my life. I like to mix basics from shops like H&M with designer clothes. Today I am wearing vintage Balenciaga sunglasses that I got from Florence and Givenchy shoes. I love vintage too. One thing I hate is when people wear too flashy clothes or show too much skin. I come from Sweden and my favourite labels are also Swedish. The most important aspect of my style and clothes is that everything has to fit perfectly. I also tend to prefer darker clothes. I think Clive Owen is a really stylish guy. I tend to wear a lot of black, though I like colourful clothes. It is just way easier to combine black than wear an entirely colourful outfit. I really like all flowery patterns too. Mood is a major influence on my style. Today I had problems with hair, so I created an outfit to suit this headscarf. At the moment I’m living in Norway, so I do most of my shopping there, but when I’m back in Tallinn I go to Zara. My favourite designers are more daring, for example Vivienne Westwood. 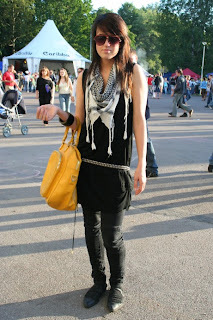 I think many young people choose their style based on what their friends wear and this holds back local street style. There was a phase when I wanted to mix everything that really didn’t fit together, now it is more about feeling comfortable. I like when people are original, but it is really easy to cross the line between stylish and tacky.